Ha! Good work, I ended up spending a lot of time on the Bowyer's Diary, he has a good eye for what will work, however kooky! Checked that Hawthorn stave on my return today, and the well painted ends have not split yet. However the rest of it has torn itself to pieces and is riven with splits. the best way to reduce splitting is to make sure the pith hhas been removed by cutting the pole, then seal the ends with a pva glue including the last few inches, I do this when storing wood for turning ut some wood is prone to split however you treat it. some also needs storing upright others laying down. the worst wood I have come across is Holly - as you say a lot depends on the time it was cut if the sap was rising. So I'm making another, this time with nice straight grained kiln dried wood! I'm cheating a bit but will post some pictures soon. Ok, bow no. 2. This is a piece of rift sawn American White Oak (Quercus alba) it was the only plank with acceptably straight grain in the saw mill, I gather English Oak (Quercus Robur) will work just as well. 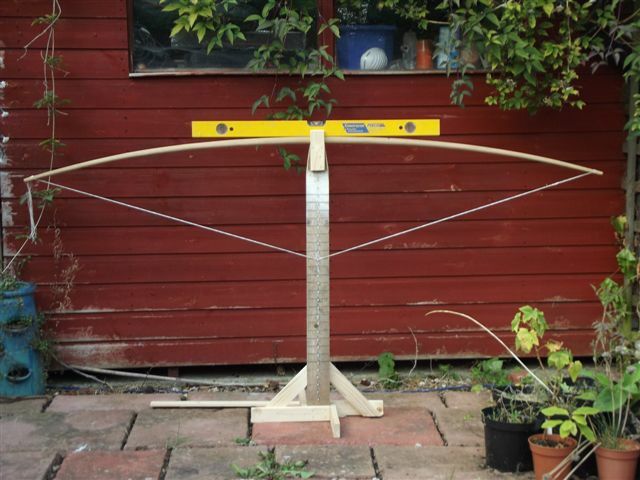 Its got a worrying sideways warp to the wood but as you can see once marked out you can get a straight longbow from it, just have to work one side down much more than the other. 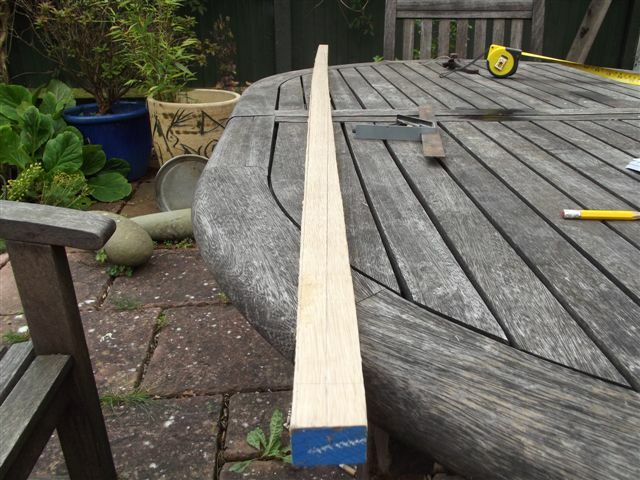 The plank cost £20 and I got two pieces cut from it suitable for longbows and a nice wide off cut with the grain a little more wavey. This piece in the picture is 6 foot 1 inch long X 1 and a quarter inches wide and just under an inch thick. Nope, that's more Medieval than Neolithic, to be fair though the Neo ones look almost the same as the Med and the modern longbow, apart from horn nocks! 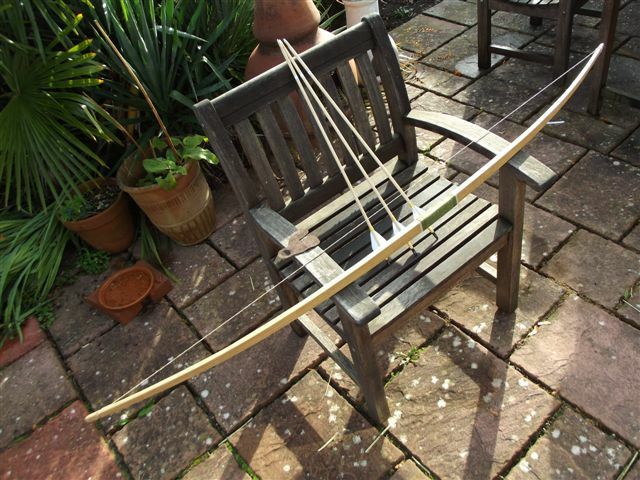 I've now finished this bow and its shooting great so I'm sort of posting this retrospectively.
" />This is the bow after initial shaping being stretched with the long string. Stupidly I didn't take any pics of the shaping. 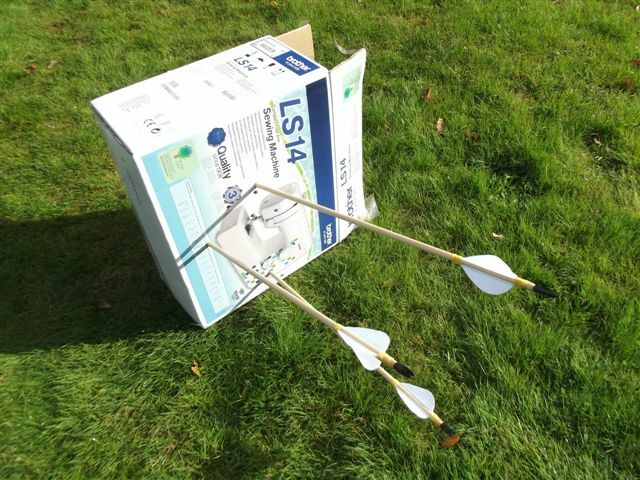 Back in June last year Skalla posted links to the backyard bowyer's PVC pipe bows heated and shaped by either a stove or a paint stripper heat gun. Looked like a fun and quick project so I've done some research. He uses between 3/4 inch and 1 1/4 inch "schedule 40" PVC to make his bows, now this thickness of pipe is available in the UK but is stupidly expensive. I'm looking into a UK pipe that will be something similar... will post what I find soon. I improved the tiller, added nails to hold the string rather than the saw cut slots and got it to stand up. This (along with a spirit level) made things better to judge along with having a horizontal line to see where the tips were ending up, the shed slats in the background did fine work here! You can see the bits of wood inserted underneath to staighten up the tiller on the wonkey patio slabs. Still not much stretch at this point but looking even. This is the bow further down the line and after shaving little bits off here and there to get the limbs kind of balanced. The left limb had a slight kink once some pull was applied but each time I noticed it a little more wood was removed and now it's getting where it needs to be. This is full draw with the long string. thats come on a treat. 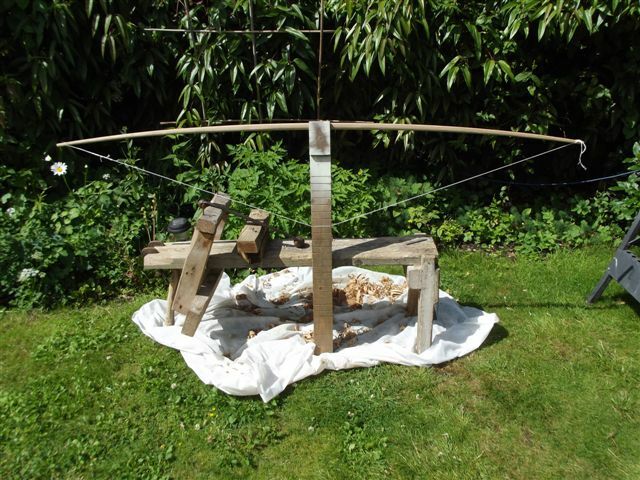 The finished bow with a handle wrap of nettle string and some hemp twine to frame it, also the arrows are modern with brass tips for shooting (all arrow accessories where bought from Richard Head bows apart from the wood which is diy dowel). The brace is a little slack but I weighed the pull on some bathroom scales and at 27 inches of pull its about 55 pounds. not bad at all! The string was made from 14 strands of 40 pound braided fishing line smeared with some bees wax. I'm very happy but too bad its not for me, pooo. Take that sewing machine box! He he! Close, an anniversary present! The missus was about to do a dress making course. I did get into trouble for putting holes in a usable box though. Get it if you ever want to build a bow, the man has fewer tools than most and walks you through all the stages and makes great bows out of sawn boards. 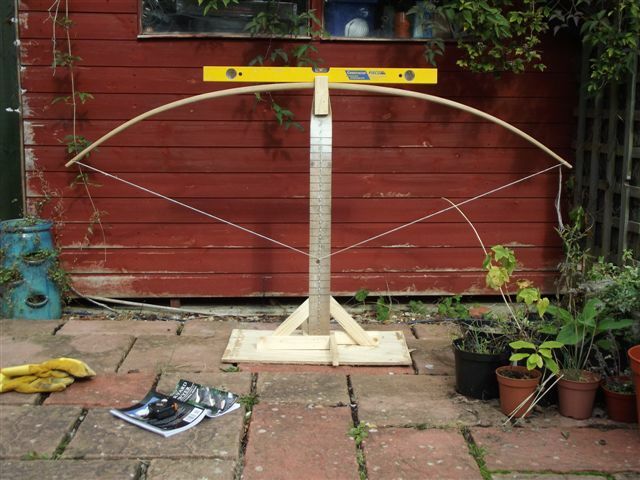 I made the long bow with the only alteration being that I made it 1 inch longer and used white oak rather than red. That's also where I got the fishing line bow string tip from. Gather them nettles soon as they are fading fast right now, although I have read recently they are at thier best after the first frost. Will you be trying to make one from gut? will be interesting to see how the natural strings perform, i have made loads of nettle string and think it might become to brittle when dried out maybe it could be coated? Fair point, I've seen nettle fibre string dipped in hide glue or gelatine. That should help. Gut is good but my local butcher already thinks I'm nuts!